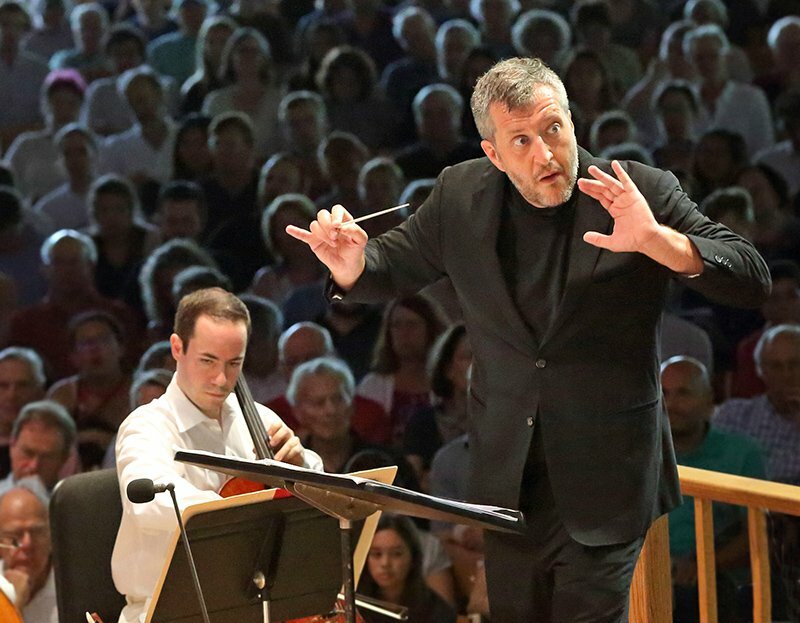 One of the wisest decisions the Boston Symphony Orchestra has made in recent years has been its engagement of the British composer Thomas Adès as the orchestra’s first-ever artistic partner. Since taking the post on in 2016, Adès has not only introduced BSO listeners to his own, restlessly inventive works, but has also conducted — and played, as a pianist — a wide swath of other composers’ music, in nearly every case providing interpretations that bristle with fresh insights. 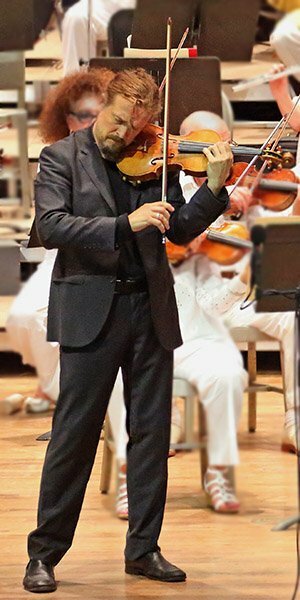 Such was the case at Tanglewood on Sunday, when he led revelatory accounts of two ultra-familiar works by Sibelius: the Violin Concerto and the Fifth Symphony. Leading off the afternoon was a suite of excerpts from Powder Her Face, Adès’s first opera and the piece that first brought him to wide attention. The suite takes several pivot points of the opera, rescores them from the 15-piece chamber ensemble of the original to large orchestral forces, and assigns vocal writing to various solo instruments. Powder Her Face tells of the seamy life and tragic end of the Duchess of Argyll, and the score is awash in audible reference to the jazz age. But rather than let these allusions morph into kitsch, Adès uses them in the service of his remarkable facility for characterization. The woozy slides in the brass and strings, for example, don’t just evoke the opera’s time frame; they signify about the debauched and unstable Duchess. In the Waltz movement, the familiar dance rhythm is repeatedly undercut by interjections from the percussion, as though her opulent life were continually in danger of collapsing. That, of course, is exactly what happens in the opera, and in the suite’s last section, a tango melody that originally suggested decadence and high spirits now teeters unsteadily into silence and gloom. The BSO gave a lively account of it, though the complex rhythms led to a few unsteady moments. In the Sibelius, Adès took on a familiar concerto that’s not only well known to audiences but also already scored with a maximum of transparency. And yet, almost everywhere he disclosed something new: counter-rhythms, dissonances, unusual instrumental colors. These details made the concerto seem wonderfully strange and freed it from any sense of routine; for all that, though, Adès also preserved and heightened the chilly austerity so emblematic of the composer’s native Finland. The soloist, Christian Tetzlaff, is for my money, the world’s most interesting and engaging violinist. He recast the shape of the concerto as well — parsing phrases in unexpected ways, drawing back on the intensity where other soloists would rush in. At times he expressly seemed to pull back from the work’s Romantic leanings, avoiding both sentimentality and excessive rubato. Yet for all the evident care that had gone into preparing the performance, it was also visceral and exciting — especially, but not solely, in the high-wire finale. As for the Fifth Symphony: this was simply the best performance of it I’ve ever heard. From the opening horn calls through the six slashing chords that end it, everything was ideally paced, shaped, and defined. That may not sound like a big deal in a repertory work, but Sibelius created an all-but-new symphonic form with the Fifth, and getting its architecture right has tripped up many a fine conductor. Adès, by contrast, made even passages that ordinarily sound drifting or repetitive into building blocks in a carefully conceived architectural plan. He did this through careful control of tempos and dynamics, and by maintaining ideal balances among instruments and sections of the orchestra. The coda of the first movement, where the music bursts free from its gradual churn and soars aloft, sounded not like a surprise occurrence but as the result of an organic process. Nor did he neglect matters of color, again finding a wealth of hidden details to emphasize. At the moment when the finale’s major theme was introduced, Adès’s attention was fixed on the bass section, coaxing more volume for a line that sounded like a gigantic cantus firmus. And as with the concerto, all this care worked at the service of, rather than against, an overall sense of exhilaration. It should be said that none of Adès’s sophisticated conceptions would have succeeded without the BSO’s extraordinary depth and responsiveness. The brass, in particular, throughout a long and taxing day, sounded resplendent at every moment. David Weininger writes the Classical Notes column for the Boston Globe, where he also contributes features and reviews. He’s also written for Gramophone, BBC Music Magazine, the Boston Phoenix, and the website of Boston NPR station WBUR.